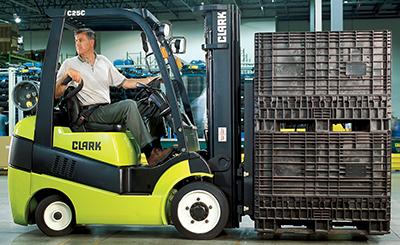 This powerful forklift brings efficiency, speed and power needed to work in demanding applications. This cushion tire lift truck is best suited for indoor applications in manufacturing, warehousing and trucking. It’s cushioned staging and adjustable hydraulic flow make it ideal for lifting fragile or delicate loads, so anyone in the beverage and bottling industry would find this to be a choice forklift. The hydraulic cushioning for quiet staging and minimal shock and vibration from the truck. The transmission automatically disengages to prevent driving against the brakes. An added safety feature – if brake is not set after three seconds, the horn will sound. Microprocessor monitors several areas of the truck and prevents engine cranking while truck is running. LED lights alert operator to important truck performance and safety features. This forklift truck can be ordered with the turret attachment making it suitable for carrying long loads sideways or working in narrow aisles. See the turret truck page for more details.